The following excertp is from Dean W. Armstrong‘s look at Dr. Sagan’s roll as an astronomer at the University of Chicago. He was a student here at Chicago; he was, as the picture indicates, president of the University of Chicago Astronomical Society (now known as the Ryerson Astronomical Society). After his short stay in the college he went to the Astronomy department and left a Ph.D. I often wonder what the dismal atmosphere of a coal-smoked Chicago was like for astronomy in the early fifties–and whether the old cranky telescope (fifty-two years old then, in 1952) did anything to inspire future thoughts. His logs are short, and there never seemed to be much observing or possibility of observing. See here for a scan of a sample logbook page. 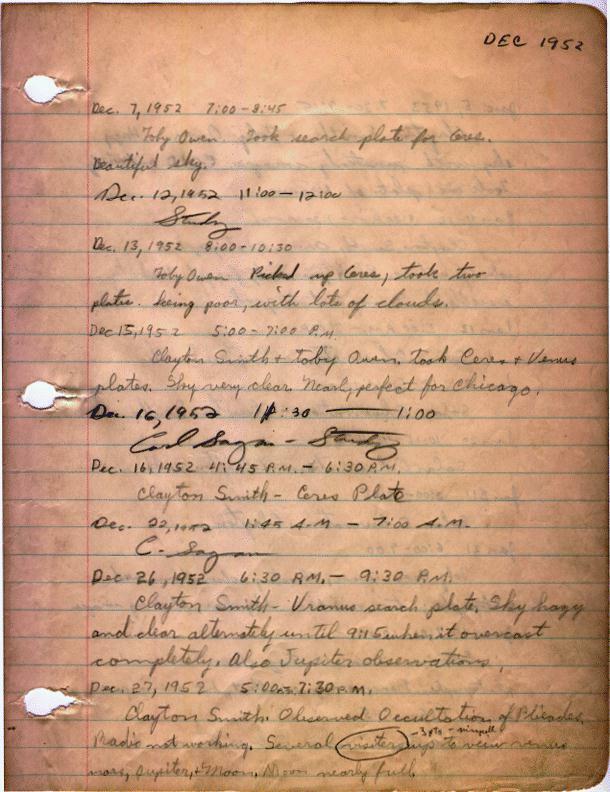 Or here for the entire text of the 1952-1964 logbook.